We have been lodging our clients' same day visa applications for some two decades, and this is a very long time, achieving a Highly Trusted Legal Representative's status in our local UK Border Agency Premium Service Centre, now called the UK Visa and Citizenship Application Centre (UKVCAS) . That means that we can help you to have your immigration application approved and your new leave issued ("leave" is the formal term for the "immigration status" usually in the form of the plastic Biometric Residence Card, or BRP) through the UK Border Agency 24 hours Super Priority service. In most cases the immigration applications prepared and lodged by the Legal Centre are considered within the 24 hours from attending your biometric appointment, compared to weeks and sometimes months of unpleasant waiting. The Legal Centre's most experienced Advocate, Mr. Anton Koval will be preparing and assisting you throughout your UK Border Agency 24 hours Super Priority application preparation and work directly work with the UK Border Agency. If a problem or some uncertainty arises during the application process, our lawyers can interact with the UK Border Agency caseworker and direct him or her at the relevant documents or issues. The UK Border Agency can only deal with certain, straightforward and under the Rules applications during the same day service. The UK Border Agency's fee is more expensive for the 24 hours Super Priority applications. All visa applications now require biometric capture and therefore you (and your family members, if any) will be required to also attend the UKVCAS biometric enrollment centre in person in order to enroll for the biometric capture (fingerprinting and photos). In most circumstances we may able to prepare and lodge your same day visa application 7 days a week, Monday to Sunday, through one of the local to the applicant (subject to availability) UK Border Agency Premium Service Centre. Please note that due to the high demand for such a service, clients are encouraged to contact our firm as soon as practically possible. Alternatively, we can prepare and lodge your applications by either the Standard application service (8 weeks or 6 months depending on the application type) or the 10 days Priority application service. 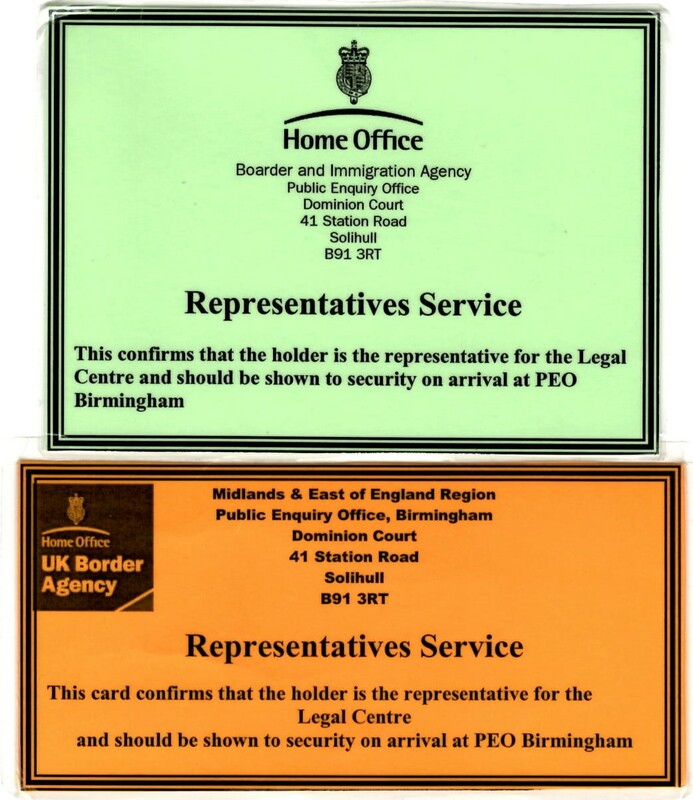 It is worth noting that the clients of the Legal Centre can retained their original documents, passport and the BRP cards by uploading or submitting copies of the relevant documents to the UK Border Agency. Following a successful biometric enrollment at the UKVCAS our clients are usually able to retain all their original documents and IDs. Also at every stage of working with us you do also retain your original documents. That means that while being represented by the Legal Centre you will not need to send your original documents, passports and the BRP cards anywhere, at all ! Now the Legal Centre's quality, timely and affordable assistance to clients, irrespective of the clients' location in the UK or World-wide, can be 100% online and paper free (for example, you can upload quality scans of your documents to our dedicated DropBox facility) for everyone.